Welcome to our cozy bed & breakfast located just outside of Yosemite Park in Groveland, California! Experience the hospitality and tranquility of escaping to the foothills of California. Spring and summer are here, and our rooms fill up quickly! Book your stay directly and find the lowest rates! Nestled in the Sierra Nevada Mountains, just outside of Yosemite, the Berkshire Inn was built with country comfort and luxury in mind, while providing affordable accommodations for our guests. This sprawling bed and breakfast sits on 20 wooded acres, with nature trails and beautiful vistas. The massive open beam construction, lounges and breakfast areas create a warm and friendly environment for all of our welcomed guests seeking lodging near the beautiful scenery of Yosemite National Park. All of our rooms are spacious and tastefully decorated. They each have private bathrooms and a private entrance from outside through French doors. 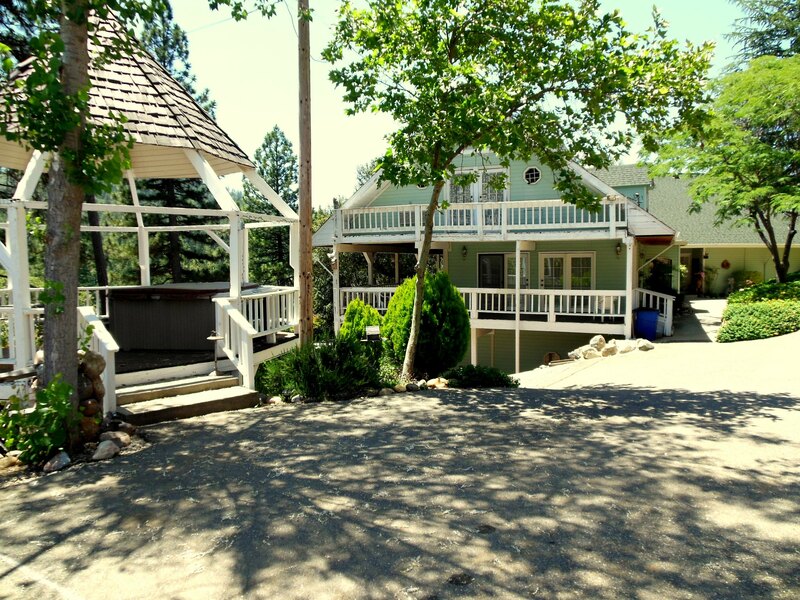 You can enjoy the fresh country air and beautiful views of the pine covered Sierras from one of our large wooden decks. Our sitting room and family room with satellite TV provides for friendly conversation and complete relaxation. You can enjoy playing cards or cozy up to a good book. Relax and enjoy an extended Continental Breakfast in the morning, either in our dining area or outside on our spacious decks overlooking the beautiful surrounding mountains. We also have a wood-burning stove to warm up to on chilly evenings.